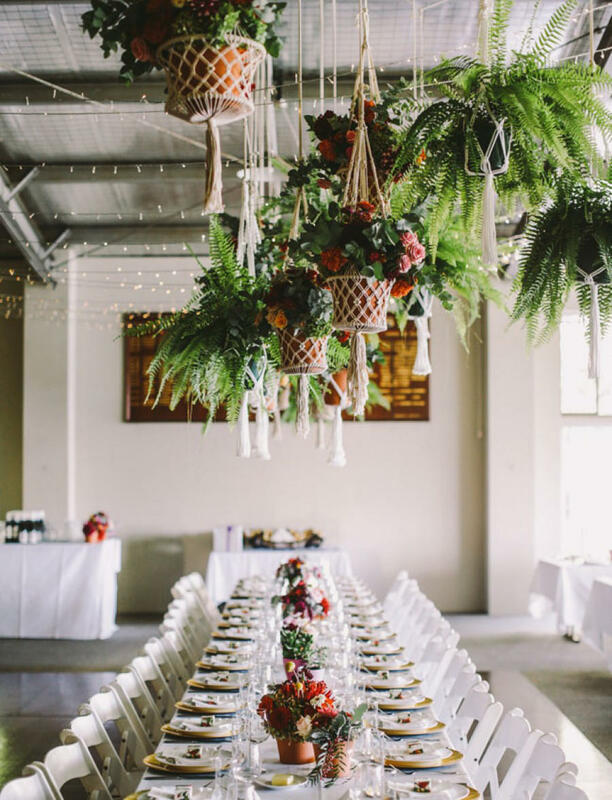 You’ll find that greenery features heavily in a tropical wedding theme, which is perfect as greenery is the biggest wedding trend of 2017 so far. 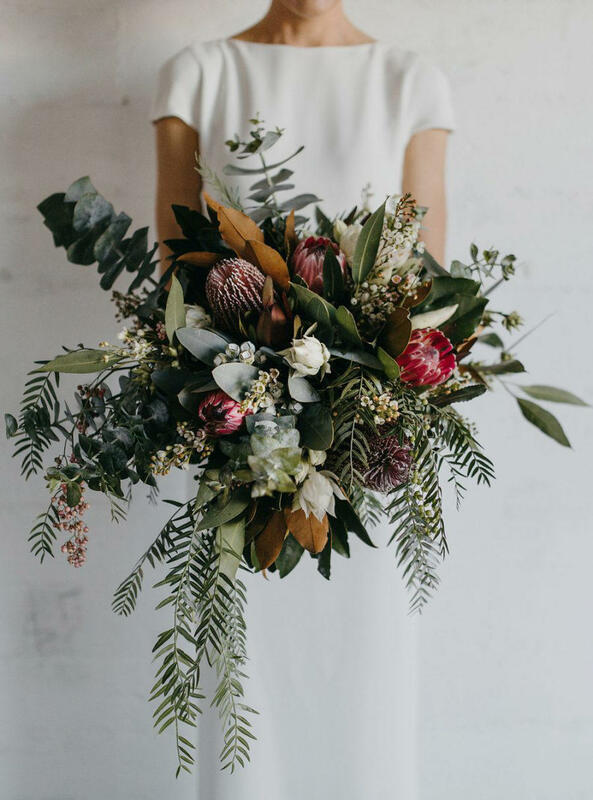 You’ll need to work in a few bright pops of colour for a tropical vibe, otherwise it’ll fall into the botanical character – which is still very beautiful. 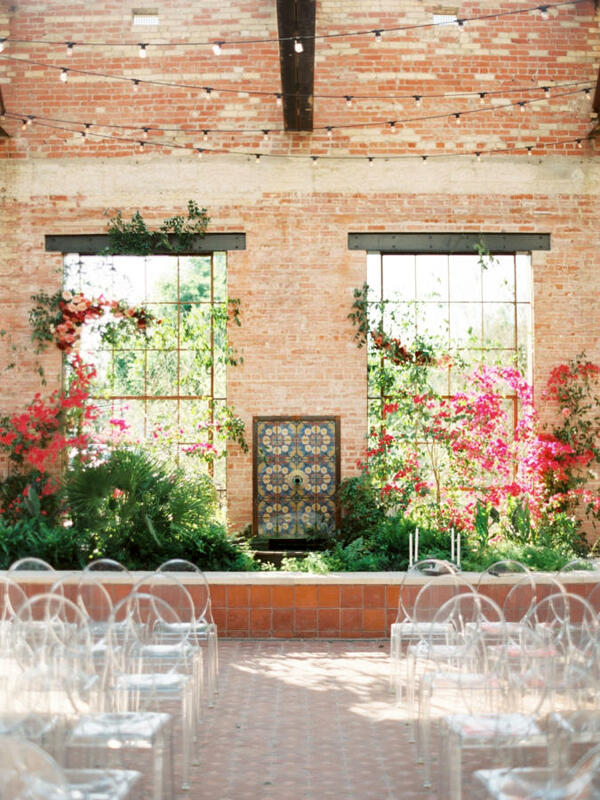 A warehouse venue or industrial space is great for this theme as it offers a blank canvas for couples to get creative. In fact, this type of wedding venue gives a tropical wedding theme a modern edge that’s just perfect for the year ahead. 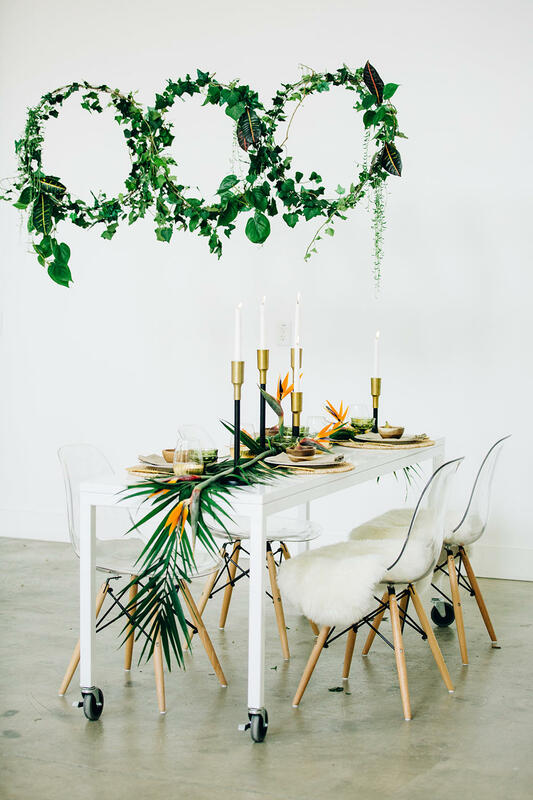 We’re still huge fans of hanging installations and statement backdrops at weddings, and they’re a gorgeous addition to a tropical wedding theme. 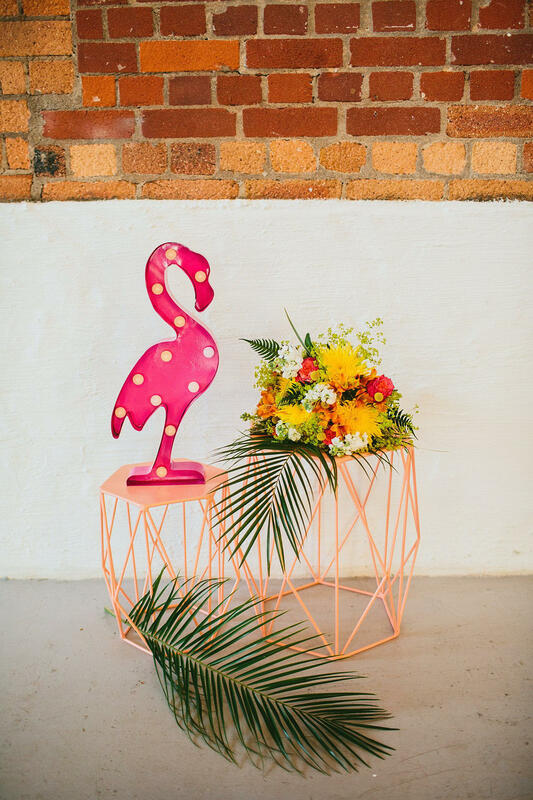 Hot pink flamingos, metallic pineapple ornaments and oversized palm leaves would all look striking against the backdrop of an exposed brick wall or old-fashioned factory. 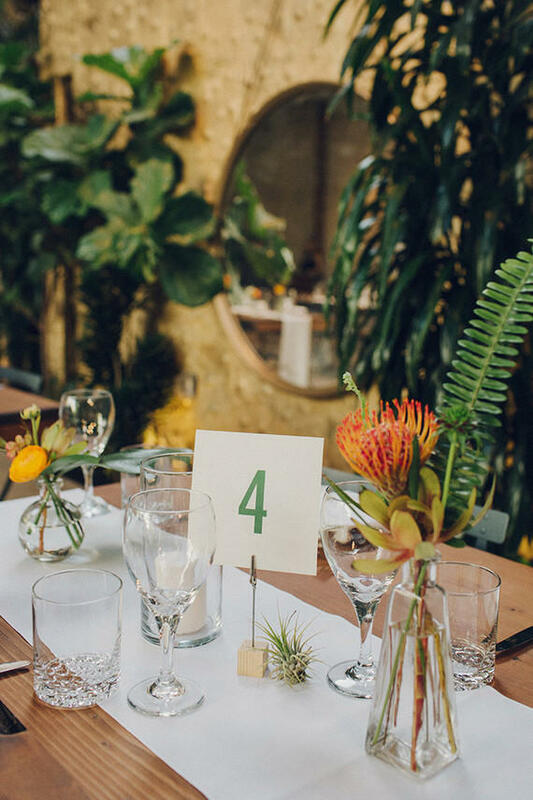 Acrylic signage adorned with exotic blooms and an abundance of greenery will add a pop of colour to your venue, and they can be used at the entrance of your venue or as part of your seating plan. 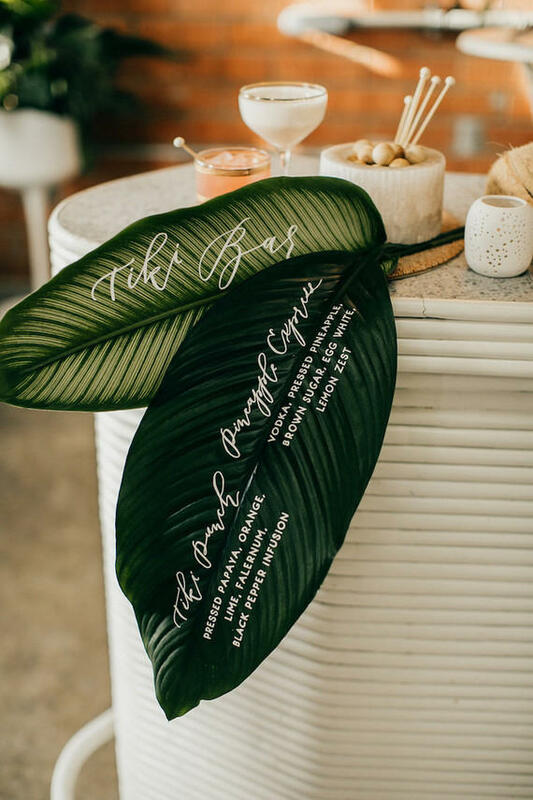 While we’re on the topic of seating arrangements – tropical leaves make fab place cards! 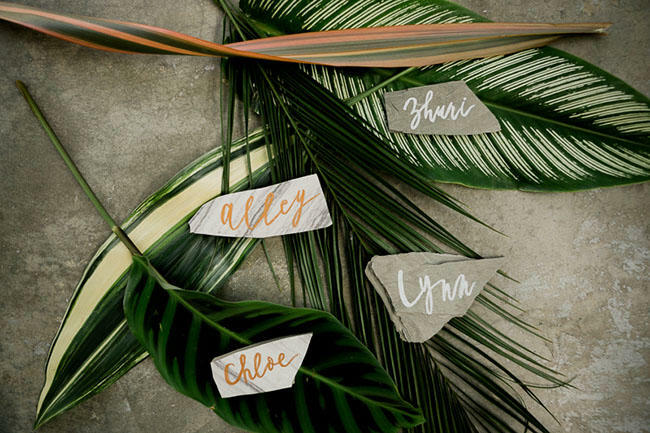 Write the name of each guests on a palm leaf and place in the middle of the plate. 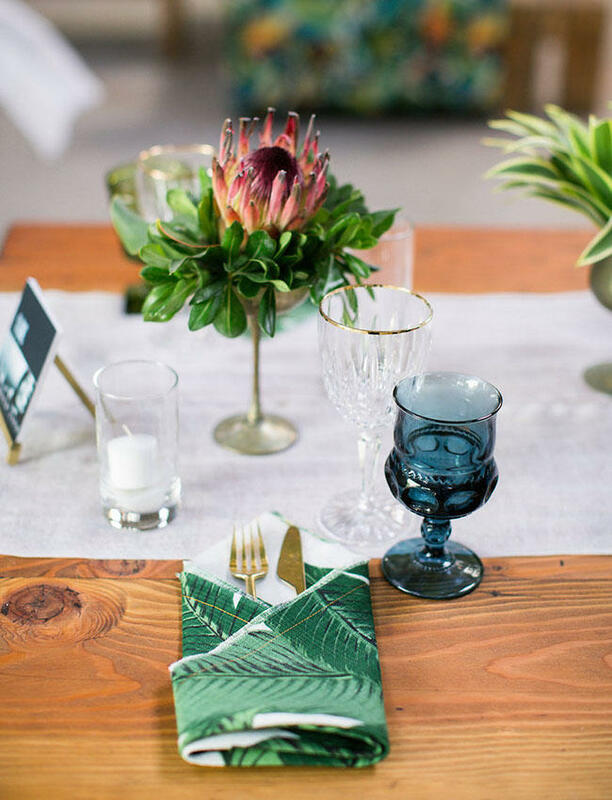 When it comes to giving your wedding tables a tropical touch, we love the thought of filling metallic or clear vases with colour-popping blooms that aren’t afraid to make a statement. If you’re planning on having candles at your wedding, opt for candlesticks that are in various shades of vibrant yellow, orange and pink. They’ll look fab lined along trestle tables and will immediately give your venue a splash of colour. We think a tropical wedding needs an array of delicious cocktails – pina colada, anyone? 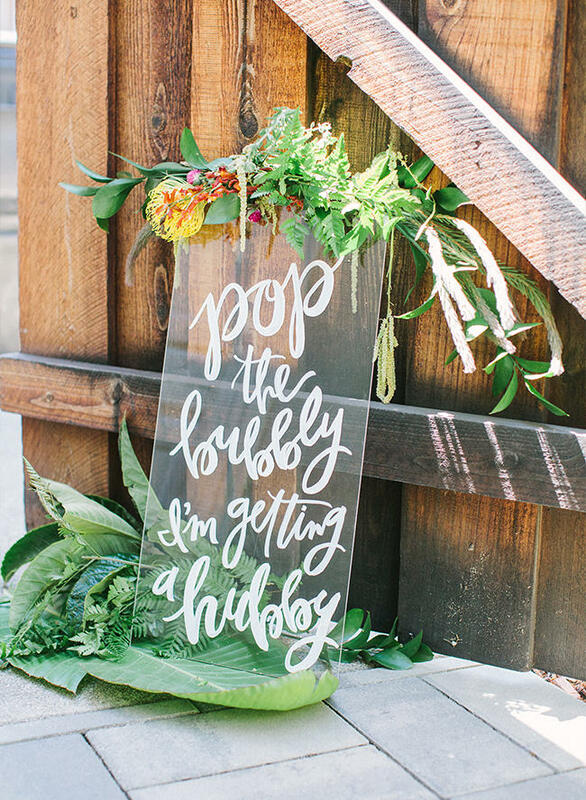 You may have spotted our post about bar carts and drink stations, and this wedding theme definitely needs one. Write your list of cocktails on oversized palm leaves and hang them to the bar cart. 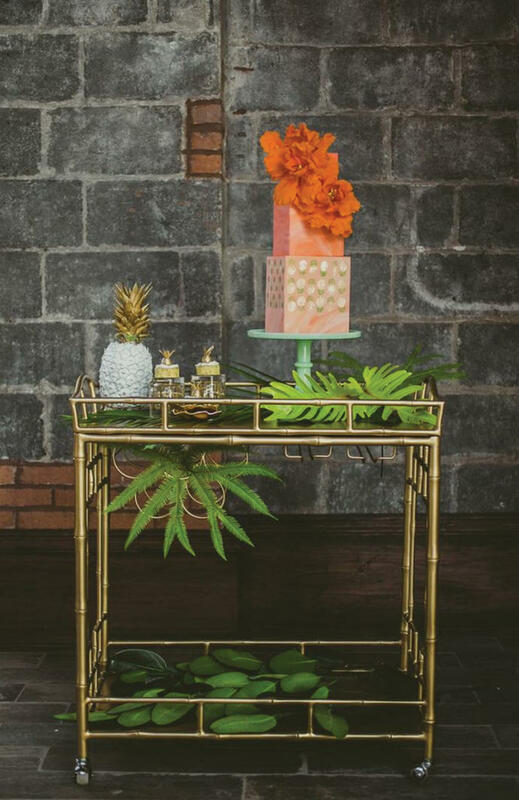 A metallic bar cart always looks good in an industrial wedding venue too. 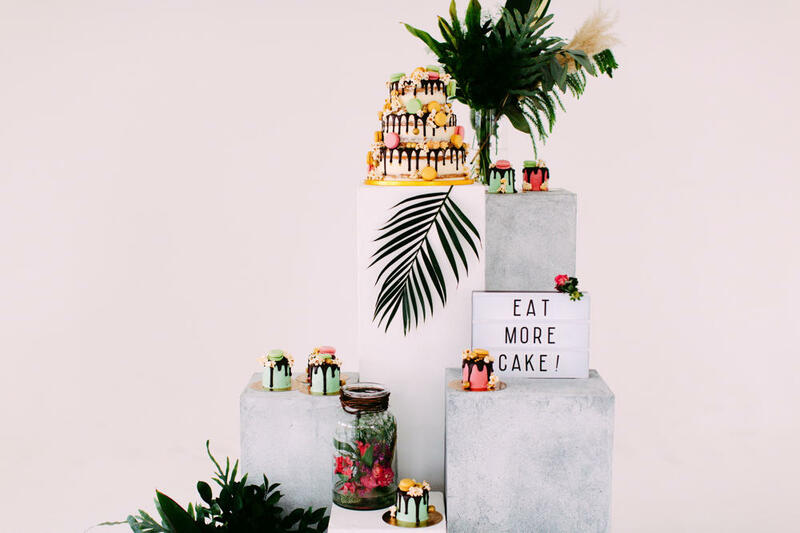 Treat your guests to a truly tasty wedding cake! 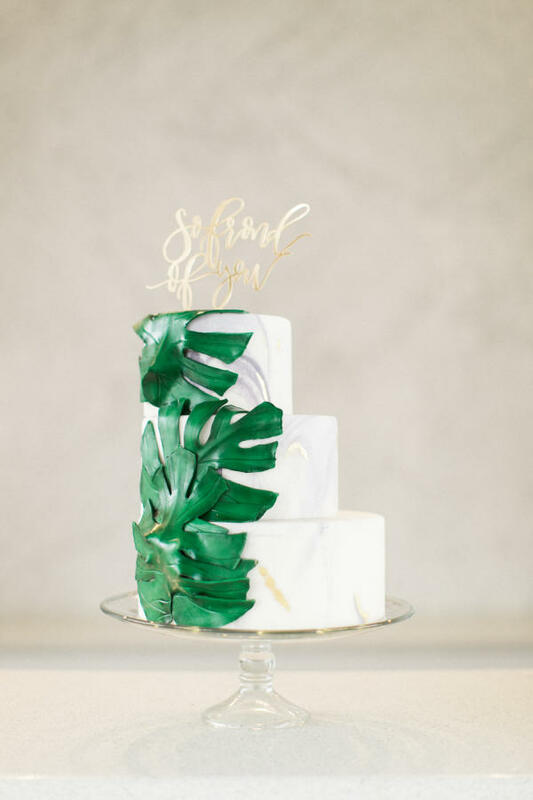 There are lots of fun and stylish cake toppers that are the perfect fit for a tropical wedding theme. 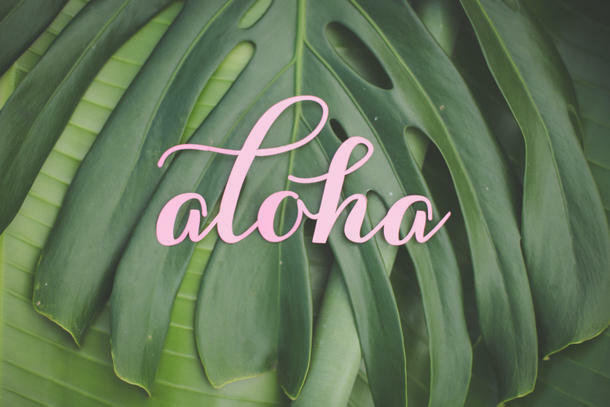 A pair of pink flamingos, palm trees or even ‘aloha’ written in calligraphy. 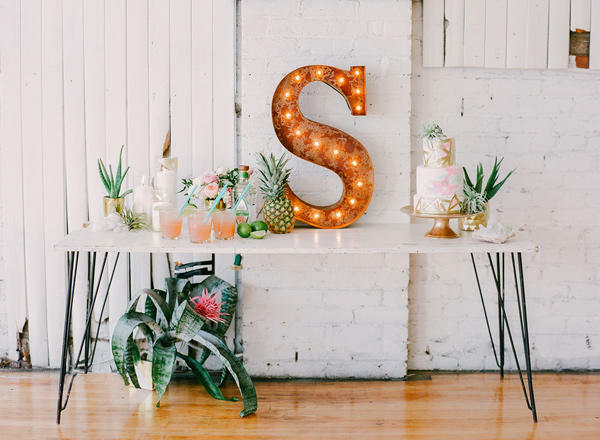 When it comes to your wedding outfit, you can incorporate subtle tropical touches here and there. A leafy hair vine will look ultra-elegant and stylish, as will a pair of colour-popping heels peeping out from your dress. However, we have to say we do love the idea of a colourful two-piece ensemble. You could rock a bright yellow skirt with a dainty lace top or the other way around. 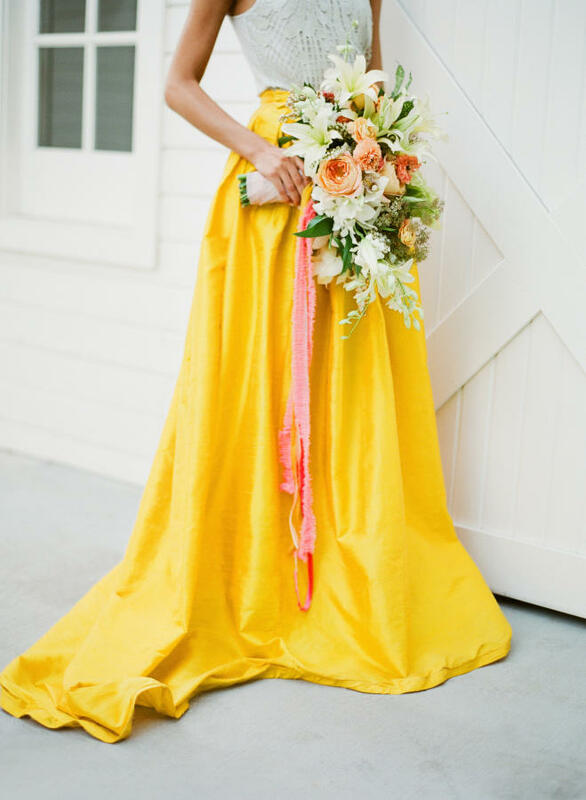 This theme is a lovely way of giving your big day a splash of sunshine, no matter what the weather!